Mobile manufacturer Nokia has hopped on the maps market, unveiling its new service this morning to monetize on its location assets. The cloud-based serviced simply known as “Here” is slated to be one of Nokia’s key ventures going forward with plans to integrate its own map service in future smartphone models. “Our location data is very, very fresh,” Nokia CEO Stephen Elop said at an event in San Francisco today. “Maps and location experiences should inspire us to sense our world. That is what Nokia is doing.” Nokia aims to integrate Here with Mozilla’s Firefox OS while planning to create both iOS and Android softwares for device developers to tinkle with. Meanwhile, we have the Web version. A quick look at Here and you’ll notice almost immediately that the maps interface looks closely similar to Bing – in fact, nearly identical. That’s because Nokia has been powering the maps engine for Bing and other services such as Garmin and Yahoo Maps. The Here layout also looks a bit like Facebook with a blue horizontal bar at the top, the logo and slab fonts resembling the social network’s typography. So what about Here differentiates itself from Google, Bing, or even Apple Maps? For one, with the Map Creator feature, Here members can help crowdsource road updates, current conditions, and changes to keep content as current as possible. Users can also add street names for obscure, smaller roads – especially in foreign regions where roads are less developed. Crowdsourced updates can reportedly show up within minutes, and at most a few hours. We’re not sure who’s verifying the changes except that you view can previous updates by the community, making Map Creator a Wikipedia for maps of some sort. On the exploration front, Here users can also search city businesses with a heat map to identify neighborhoods with more restaurants, stores, tourist attractions, and offices. 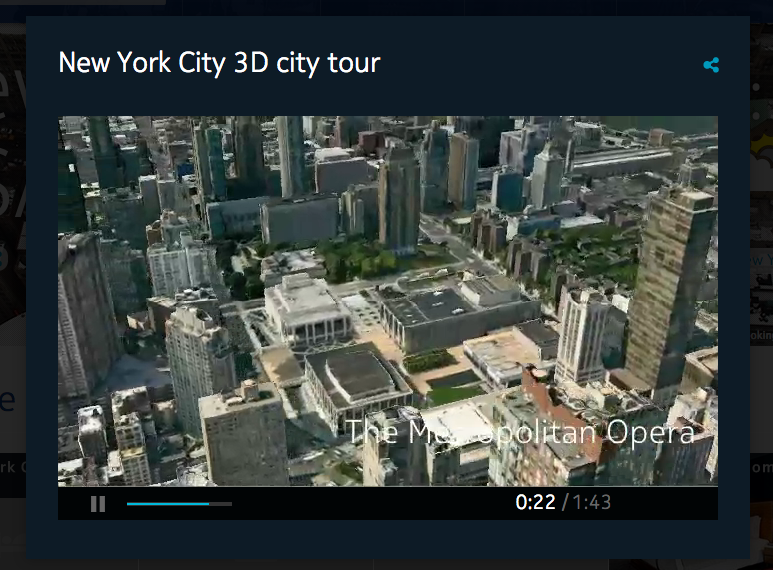 In select cities, there are also 3D video tours, highlighting famous landmarks and attractions in an overhead flight across the metropolis. Users can “collect” places and save them to their accounts so they can get quick access to directions and information next time they log in. Unlike Google, directional information only includes going by foot, public transportation, or drive – no bikes. Still, since the service is fresh off the presses, there are obviously some kinks to be had. For example, searching for a local business you know and love might appear on Bing and Google fine, but Here has yet to recognize the search for my Thai food joint even though it’s been around since 2003. Even the retail chain Pret A Manger across the street from our office has its name jumbled up on Here’s map. It’s clear Here’s got a long way to there – if there means the standards of Google Maps. Until then, the Map Creator function should please international fans if they’re up for some Wiki-esque work to their local roads.